Every donation of blood has the capability to save up to 3 lives! Join us on Wednesday May 15th from 11:00AM to 4:00PM and make a difference. Sign up HERE. In our Membership class , we will be going over our core values, our beliefs, our history and our vision. We will have lunch and provide childcare as well. We really hope you join us and help us make a big difference here in this community. Take ownership of your church and sign up here for our next one on Sunday November 18th from 11:45AM to 2:00PM. Join us for a night of bowling and food. Thursday April 25th 7PM at Bowlero Wallingford Bowl. $20 includes 2 hours of bowling and pizza! Sign up here. Deep Freeze is a weekend winter camp hosted by Berea Ministries in Hebron, NH. Winter Berea is a yearly tradition for students at Fellowship Church. Every year our student ministry brings 30-50 students to this weekend experience where students can grow their faith, grow their relationships with others, have loads of fun, and making lasting memories. Join us for an afternoon of ‘sisterly love’ on Saturday January 26th from 2:00PM-4:00PM. This FC Women’s event will include a talk on love and sisterhood as well as a dessert bar. Interested? Sign up here. The FORGE is Fellowship Church’s men’s ministry, and it’s going to be kicking off on Thursday the 24th at 7:00PM. Reverb is an all night event where Students from Churches all around New England gather for one fun-packed night. On Sunday, October 28th from 4:00PM-5:30PM, Fellowship Church will be hosting second annual Trunk or Treat. This is an event for the whole family where our community can come together for some holiday fun. Families at FC will be decorating their trunks and filling them with candy for families in our community to come and "Trunk or Treat." Join us on Thursday, September 20th at 7:00PM for the Night of Worship. Throughout this night we will experience God through prayer, communion, and praise through songs. A ministry for moms of all ages, that provides love, support and the opportunity for friendship to women with the extremely difficult and important job of motherhood. We will meet each Thursday from 9:30am to 12:00pm for breakfast, fellowship and parenting book studies. FREE Childcare. Join us for the Last Blast of summer on August 26th! We will enjoy a combined outdoor service with live music, baptisms, and an inspiring message. After the service will begin the festivities which includes: FREE food, child and adult inflatables, face painting, volleyball, yard games, live music, paintball, bungee trampolines (New), and various other activities. This is an event for the entire family where adults and kids of all ages can have a day of fun. Join us for our 'Grand re-opening"of sorts to our FC Women and their ministry team. 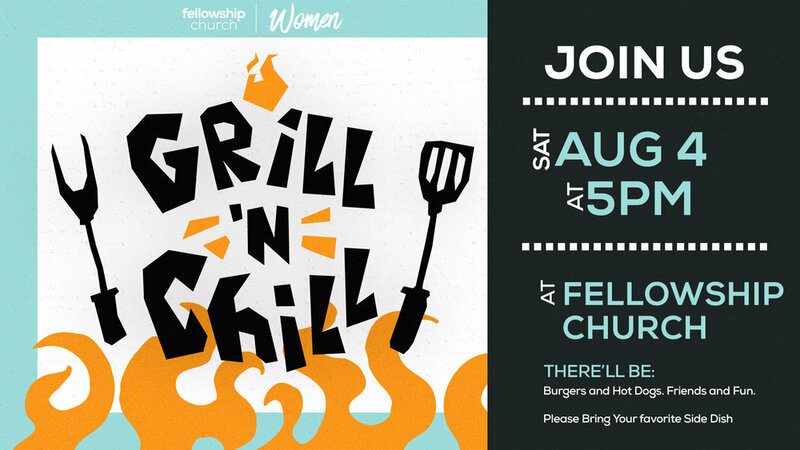 We will be hosting a "Grill n Chill" BBQ cookout here at Fellowship Church on Saturday August 4th from 5:00PM to 7:00PM. Burgers, hot dogs and chicken will be provided. Please bring a side dish or dessert to enjoy. FREE Childcare provided! This will be a fun night to grow in your faith as well as getting to know some great women we have here at FC! If you will need childcare, click here. What: Living Proof Camp is a week long blitz of events & activities hosted by Fellowship Church's Student Ministry. Each day contains a main event, evening activities, and a spiritual element where students can encounter God. The uniqueness of this summer camp is, that if a student can’t make it for the whole week, they have the option of joining us on any particular day. This also allows students to invite their friends to join us. Additionally, if a student can’t make it to the main event, they can always join us at the evening activities for FREE. Students are welcome to stay the night any or all nights of the week. (Except Friday). Certain Meals are provided on each day. Below is the options breakdown and list of main events and evening activities. 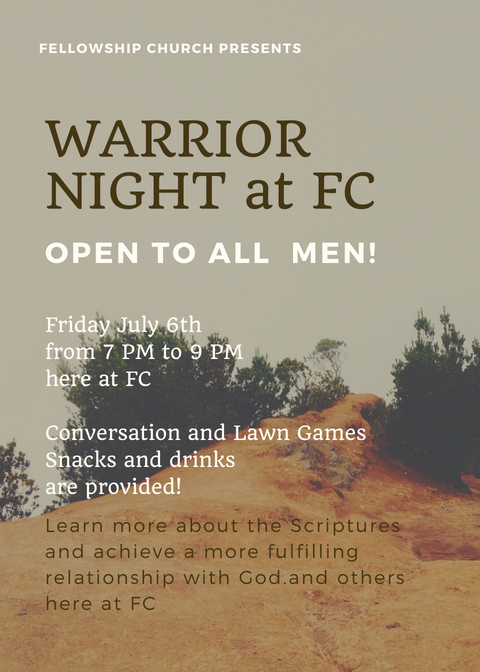 Join us Friday July 6th 7:00PM for this Men's Event. This night will consist of conversation, lawn games and snacks with a goal of bettering ourselves, strengthening our relationships and finding the Warrior within you. Sign up here! VBC is for kids ages 4 - entering 8th grade. Your kids won't want to miss this fun, interactive, FREE camp. Kids will come home each day singing our theme songs and talking about how they are rescued by Jesus. Their creativity will be sparked through interactive decorations, fun inventions and great dramas. We have maxed out! Thank you for your prayers! Keep your eyes open for next year's dates for VBC! That question haunts many of us. What if you knew that God believes in you and great men and women who came before you are cheering you on? We’re all in the race of life, but none of us have to run it alone. Every year we, here at FC, join many other New England churches and head to New Hampshire for a 3 day conference for men and every year we leave different. We also leave with some great memories like the year we brought sparring gloves and hosted a 'fight club' or the the year we hacked golf balls into an outdoor jacuzzi (not intentionally), or the year we took a long hike up a scenic mountain and almost lost a few men. All great memories! This year's Warrior Conference is May 31st-June 2nd. So book off from work today! Check out what's in store here. God is doing great things each year at this event. Men here at FC have left the event a better person.......a Warrior. Men who were once isolated hanging with an army of other men. The 3 days consists of national known speakers, great worship music, and first class amenities. There's a lot of free time for hiking in the very scenic mountains, playing basketball or tennis, swimming, fishing, mountain biking, or just plain relaxing. Spend time with the guys or on your own. There's a lot of freedom here. I'm hoping this is the year you will join us. You won't regret it and neither will your family and friends. Warrior up and sign up today here for more info. Invite your friends and family to an event of worship and encouragement as Ashley Goins, founder of Upward517 Ministries, will share her personal testimony of surviving sexual abuse and speak on the victory that can be found through such horrible tragedy. Monday April 30th 7:00PM-8:30PM. Sign up here! Join us on Saturday April 28th from 9:00AM to 12:00PM to help make our campus beautiful. Bring any tools you may have (rakes, weed whackers, gardening gloves, shovels, wheelbarrows, etc.) Afterwards, we will be eating hot dogs on the grill. This is a great way to serve as well as meet some great people here at FC! You can sign up here. Join us this Christmas for one of our three identical Christmas services. Celebrate the birth of our Savior who sets all captives free, heals our deepest wounds, comforts us in our pain and blesses us beyond our wildest dreams. Invite your family, friends, neighbors, co-workers, and pretty much everyone to experience this fun and memorable event. Everyone is welcome! Christmas is full of memories! This Christmas, let's make another memory together. Every year, we here at FC have the opportunity to ring the kettle bells for the Salvation Army. The serving opportunity will certainly get you in the Christmas spirit! On December 16th from 10:00AM to 6:00PM at 4 different stores here locally, Fellowship Church will take over! Sign up for a slot or two and help us and the Salvation Army out. Bring a friend or your family to help. You can sign up here to join the fun! 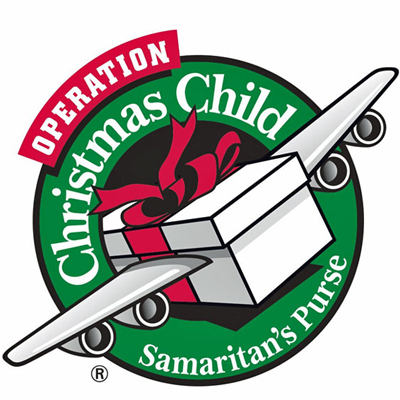 The world's largest Christmas project of any kind, Operation Christmas Child, uses gift-filled shoeboxes to demonstrate God's love in a tangible way to children in need all around the world. We here at Fellowship Church want to help. Pick up your empty shoebox at FC and bring it back filled with the needed items (list is in the box) to bless children throughout the world with toys and needs as well as tools for them to learn about Jesus Christ. We've been a part of this for years and love the difference it makes. Gathering coats, jackets, gloves, hats and scarves for the community through Streetfire Ministries. Bring your grills and food. Join us for a Flag Football tournament as well! Join us on Monday, September 25th 6:30PM to 8:00PM for worship and inspiration. Listen to 3 couples share with you what God has taught them in their relationships along the way and how it improved their marriage. Whether you have been married for 50 years, are a newlywed or a couple considering marriage, this will be a great night. FREE CHILDCARE provided. Bring a dessert to share. Sign up here! 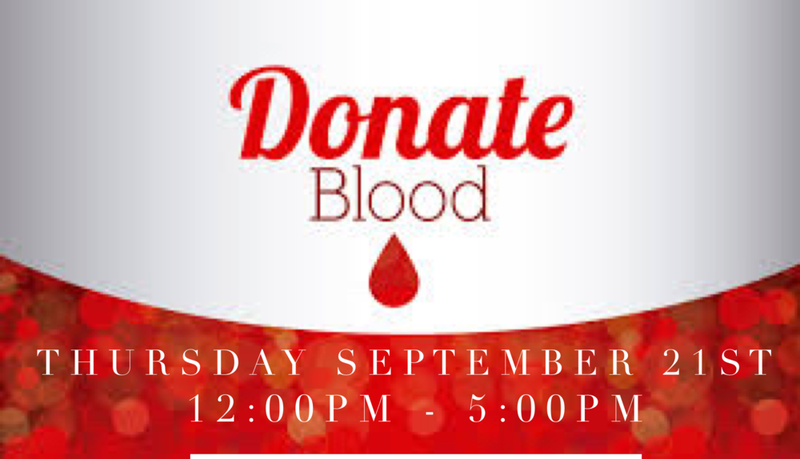 Help save lives and donate on Thursday September 21st from 12:00 PM to 5:00PM here at Fellowship Church. You can make a difference! Every donation can save up to 3 lives! Sign up here. It's that time of the year agin. Fellowship Church is getting ready to begin a whole new semester of Growth Groups. Click HERE to see the full list of groups and sign up. A ministry for moms of toddlers through teens, that provides love, support and the opportunity for friendship to women with the extremely difficult and important job of motherhood. We meet Thursday am for breakfast, fellowship and parenting book studies. Some things we learn while following Jesus leave us with more questions than answers – like the afterlife, His second coming and even how He works in our life. In this series we’ll look together at things that are harder to understand but lead to a deeper and more authentic faith. This is one of the biggest parties of the year. Join us on Sunday August 27th at 10:30AM for a combined outdoor service including our message, worship, baptisms and a carnival-like atmosphere. We will have inflatables for adults and children, a rock climbing wall, volleyball, face painting, free food, an ice cream truck, live music, yard games, and many other activities, This is fun for the whole family! We expect 600-800 people on our campus this day so it takes an army to help out! Wanna serve here? Sign up here. Take a look at a recap of last years Last Blast! Join us for a fun afternoon of bowling with fellow FCers. Bring your family and friends to this annual event. Discounted rates are available for our games and shoes. This is a great opportunity to get to know others here. Trophies and prizes will also be given! You can sign up here. This is a night to get away from the busyness and chaos of life. A night to get to know other amazing women at FC. A night to worship our Lord and hear from Him. A night to remember. Hear from 3 incredible women of Fellowship Church - Vicki Pancoast, Lara Santamaria and Kathryn Batzner - regarding what God has taught them in regards to the busyness of life and how best to manage time with God, family, careers and even yourself. Finally, at the end of the night there will be time to get to know others over dessert and share what you've learned along your journey as well. This year's Warrior Conference is June 1st-3rd. Check out what's in store here! God is doing great things each year at this event. Men here at FC have left the event a better person....a Warrior. One who walks with integrity, one who leads his family and one who points others to Christ by his actions. I've seen it every year. We have men that came home from this event ready to change the world. The 3 days consists of national known speakers, great worship music, and first class amenities. There's a lot of free time for hiking in the very scenic mountains, playing basketball or tennis, swimming, fishing, mountain biking, or just plain relaxing. Spend time with the guys or on your own. There's freedom here. I'm hoping this is the year you join us. You won't regret it and neither will your family and friends. Warrior up and sign up today here for more info.